Is Maryland Real ID compliant? If so, when do I need to get a new driver's license? A viewer reached out to us asking whether Maryland is going to be Real ID compliant, and if so, when do Marylanders have to get the license? To get our answer, our Verify researchers turned to Maryland Motor Vehicle Administration and the U.S. Department of Homeland Security. RELATED: What's with the ridiculous wait at Maryland's MVA? They confirmed Maryland is Real ID compliant, meaning they are processing new IDs and you can get one....yesterday. By October 1, 2020, Marylanders need to upgrade their driver's license to go through TSA, enter a federal building or nuclear power plant. If you don't upgrade before then, you'll have to bring your passport to the airport as an extra form of ID. But take a look, you might already have a Real ID without knowing it: check for a "D-L" and a star on the right-hand corner of your card. That indicates it's a Real ID and you're good to go. MVA still recommends, even if you have the "D-L" and star to go to Real ID Lookup page, to make sure you're covered. If you don't have one, you'll have to physically go to the MVA with four documents: proof of age and identity (i.e. a passport), proof of social security (i.e. social security card or W-2 form), and two proofs of residential address. 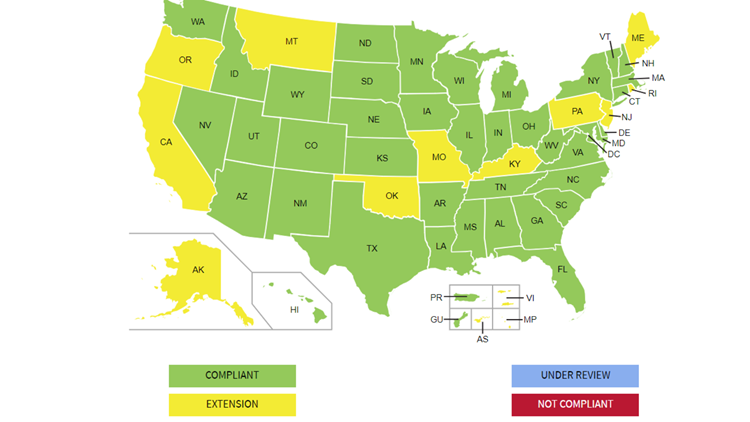 So, we can Verify, Maryland is already Real ID compliant, along with 39 other states and 2 territories. What about Virginia and D.C.? According to Homeland Security, both already are Real ID compliant. In Virginia you have the option to opt in, or not, before the deadline hits. "Virginians now have the option to upgrade to a REAL ID compliant driver’s license or identification card, or stick with DMV’s standard credential," Virginia Department of Motor Vehicles writes on their website. "The credential is completely optional. If you won’t need it, you don’t need to get it."